Looking around the web today to get ready for October. I can't believe it is almost here and my baby is almost 1. Seriously? Where did this year go? There are so many fun ideas to get you feeling festive as the holidays approach. Bat chandelier by Heartland Paper. 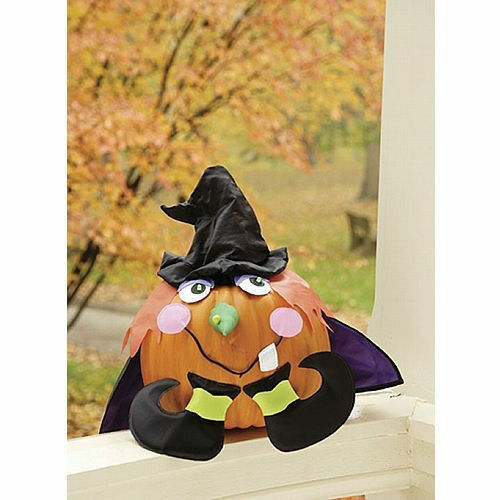 Dress up your pumpkin like a witch by using a flag; this idea is from Home Decor Trends. Bake up these treats from Bakerella. Whip up these for some Corny fun! Free pattern by Material Whirled. Scary Spider Wreath! Directions found here. And lastly I LoVe this porch. And sadly I'll never have it because I am NOT painting my door orange! But if I did I would need the black feathered wreath. Cute, happy, but totally halloween! What are you planning on doing to halloween-up your house?